Kidderminster Harriers have signed much-travelled former Redditch United and Peterborough United defender Exodus Geohaghon on a one-year deal. Geohaghon, 27, was at Darlington until his contract was cancelled in January. Harriers assistant manager Gary Whild, who knows the player from his Redditch days between 2006 and 2008, said: "He was very raw when he came to Redditch, but the potential was always there. "He's had a decent career, but he's young and there is room for improving." Geohaghon, who was on West Bromwich Albion's books as a youngster, spent a season at Bromsgrove Rovers before his move to Redditch. He had his best days in two seasons at Kettering, which earned him a move to Peterborough. 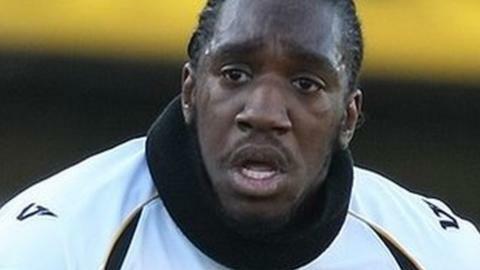 He then had loan spells at Rotherham, Shrewsbury Town and Port Vale before moving on to Barnet. He spent last season at Darlington, including another loan spell at Dagenham & Redbridge, before ending the season with Mansfield Town. But he is now intent only on helping Steve Burr's Harriers push for promotion after successive sixth-place finishes. "Some of the clubs I have been with have been going from promotion," he added. "And I want to achieve something and not settle for less. "That's been a great experience for me, and hopefully the things I have learned can be used here." Geohaghon joins fellow new signings Cheyenne Dunkley, Ricky Shakes and Danny Pilkington at Aggborough.